This coffee will be fresh roasted for you. We expect Klatch Coffee will roast and ship this coffee in 1-2 business days depending on their roasting schedule. 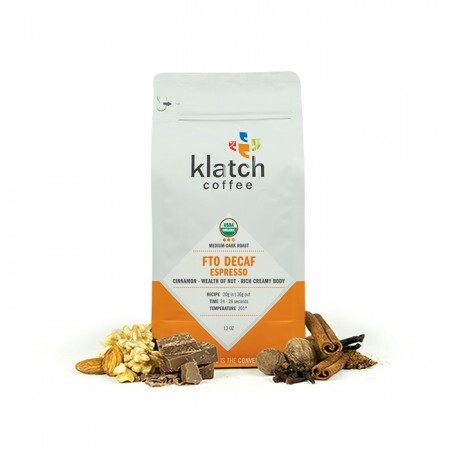 This is the Decaf Espresso Fair Trade & Organic brought to you by Klatch Coffee. This decaf espresso is a remarkable blend of Indonesian, African, Central and South American coffees. All of the coffees are Fair Trade and Organic certified and produce a cup that is extremely rich, ranging with notes of deep cinnamon and a roasted nuts, wrapped in a luscious creamy body.